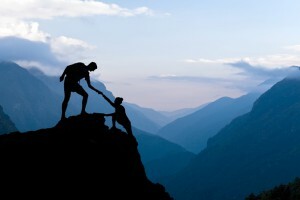 ARTICLES & LINKS Teamwork: Who Has Your Back? Collaboration is the new imperative. What does it require of employees? How do you turn a group of people who work together into a team? Teamwork and collaboration organize people around projects, to create a common focus. They create interdependencies: If one team member fails to perform, there are consequences for the whole team. Work groups are sometimes called – even by their members – teams. But if there is no sense of a common mission, then that “team” may just be a group of people who happen to be working in the same place. If the priority is on individual performance rather than a shared objective, it’s not a team. If the failure of one member to pull his or her weight has little impact on the others, it’s not a team. Teams are organized around a mission, and share a commitment to that mission. Teams don’t always need leaders, but they need leadership. And the best leadership is a collaboration among employees at every level of an enterprise – the whole team. Anything less than a solid commitment to a one-for-all, all-for-one approach threatens the success of the entire enterprise. We may, for example, assume that teamwork requires that we all work together, and that introverts who prefer quiet contemplation are disengaged. Those introverts may return to the group with a more valuable contribution than they could have made in a discussion. Get to know your team members and help them work to their strengths. A DiSC personality assessment can build a good picture of the behavioural attributes of your whole team. Make sure people understand and are committed to their roles. Set aside time for one-on-one coaching. Create a judgement-free environment in which everyone feels safe admitting to weakness and error – and asking for help. Embrace differences of opinion. Passionate, creative debate happens when people care about their work. Building a productive team does take some effort. But the return on investment is unquestionably large, in terms of measurable impact to the organization and increased job satisfaction for the team members. From anthills to coffeehouses to the social web, 10 TED Talks Every Team Should Watch is filled with insights on collaboration.